Unitec’s vision for the Wairaka Precinct is a ‘vibrant urban village, with a compact, innovative and modern educational core’. RDT Pacific is helping to guide New Zealand’s largest institute of technology through its reinvention, from both a service delivery, and a property perspective as it creates a new education hub for the 21st century. The institution is making a strategic investment in educating New Zealand’s future workforce rather than building and grounds maintenance. Its wider aims are to provide highly flexible and technology-enabled learning opportunities, prepare students for high quality work and develop new business ventures that provide valuable experience to students. These aims can’t be achieved without a rethink of its property assets: the Wairaka Campus contains 177 buildings across 53.5 hectares. All expensive to operate and maintain, many are not fit for purpose, and some pose a seismic risk. As the Programme Manager, RDT Pacific has the highly experienced team of Associate Director Mike Hanson, and Director David Prentice committed to the project. They are tasked with setting up the programme of procurement and construction, and helping to develop a project execution plan and governing structures for the redevelopment. This entails the programme delivery framework, and working with project-specific user groups to gain the information needed to inform the programme business case, as well as the design of the individual projects. Unitec is embarking on the first projects that form the property strategy component of its transformation. RDT Pacific Associate Director Jeremy Brown is managing the Building 183 extension project on campus that will fulfil two key aims. It will provide a decanting space for larger projects, and become a prototype and lab to inform the design phases of the future spaces. This is vital to the success of a strategy that will create a shift in the way students learn, from ‘chalk and talk’ to more interactive and technology supported modes that will be flexible according to the discipline, course and level. Learning lounges will be agnostic, reconfigured at the end of each session, and offer different ways to sit, stand and collaborate. The property strategy maximises utilisation in terms of space and time and supports studio and social spaces to become the norm. Consolidating the various buildings will approximately halve Unitec’s footprint – by utilising the buildings for more hours each day. Running costs of individual facilities may go up, but there will be fewer, more efficient facilities. The development will respond to fundamental global shifts in education. Employers are increasingly seeking high-performing, work-ready graduates who can add immediate value in the workplace, with ‘soft skills’ to complement their technical and creative capabilities. Unitec will rise to this challenge with a flexible and future focused learning experience that meets the changing needs of students and the industries they’re training to enter. The Construction, Engineering and Trades Building(s) will provide multi-discipline spaces and computer simulated learning. The library and other communal spaces will become ‘Learning Commons’ – immersive, open environments that encourage conversation and cross pollination. A dedicated commercial and enterprise exchange will bring businesses and employers into the education hub, allowing more students to collaborate with future employers on real-world projects. The Concentrix and IBM Delivery Centre offers students both paid employment and an opportunity to integrate their learning with Concentrix and IBM’s business activities. 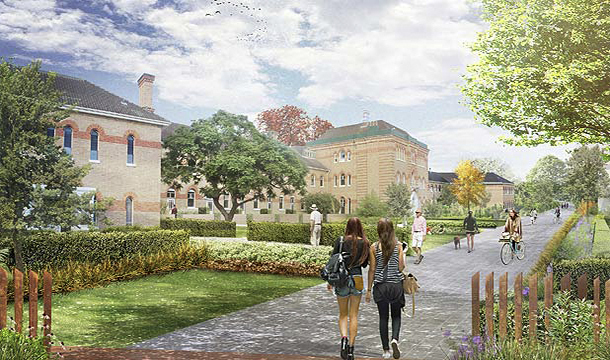 Along with new trades’ facilities, one of the first construction priorities will be the development of a new student hub – one that will form the new heart of the campus and provide a starting point for thousands of future careers.